Napolitano: New Immigration Policy Is Part Of A 'Strong Enforcement' : The Two-Way The Homeland Security secretary said one key part of law enforcement is prioritizing and this policy does just that. 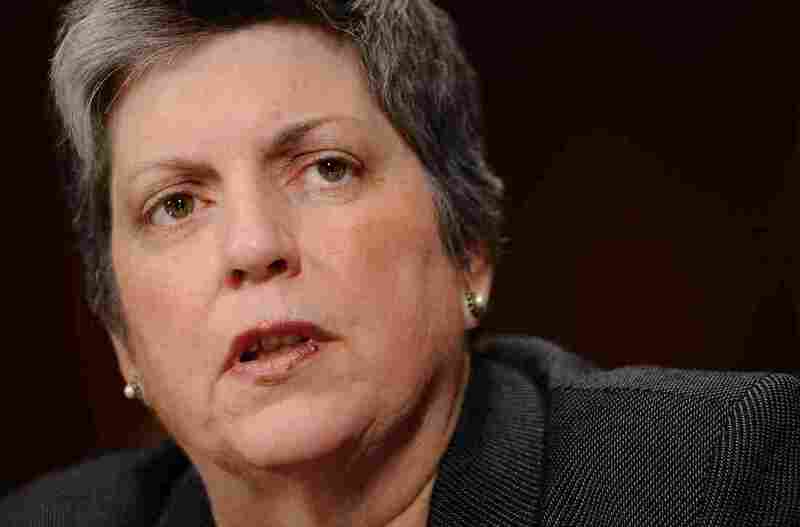 In an interview with All Things Considered's Audie Cornish, Homeland Security Secretary Janet Napolitano said the administration's decision to defer the deportation of some young illegal immigrants is a part of a "strong enforcement" of immigration laws. She said that this administration has stymied illegal border crossings and stepped up deportations of criminals. "Strong enforcement also embodies looking at different categories differently when the facts justify that we do so," Napolitano said. "These individuals really fall in a separate category and we ought to address it as such," she added. Like she did earlier today, Napolitano characterized this move as prioritizing. "What we're doing is saying, 'Look when we enforce the immigration law, we want to focus on those who have violated the criminal laws in addition to immigration law, who are repeat violators or are people we catch right at the border," she said. Audie asked Napolitano to respond to critics who have said with this policy shift, the Obama administration is essentially bypassing Congress. Napolitano said this doesn't take the place of legislation. "This is not the same as the Dream Act, because there is no pathway to citizenship.There's no pathway to permanent legal residency. It's deferral of removal action," she said. And it's something the U.S. has done before, she said. For example, the Obama administration decided to defer the removal of the undocumented widows of service members. We'll post the as-aired version of the interview a little later tonight.